Justice, Inc sets the standards for dry bulk haul in the Rock Mountains. 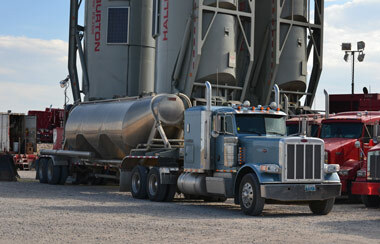 At Justice we help our customers manage the risk and cost of frac commodity transportation. We understand that trucking is one of the most expensive and high risk areas of the production process. Our focus is to operate safely, efficiently, and at a fair price. With operations throughout the Rocky Mountains, we are capable of serving our customers in every major oilfield play in WY, CO, UT, NV and ND. The Justice culture of safety and training coupled with our fleet of safe, late-model equipment ensures you incident-free service. Our goal is always to meet your expectations and provide a safe working environment. We emphasize safety in all that we do and have invested heavily in our health, safety, and environmental policy and training. Our new employee orientation and training focuses on safe work practices and hazard identification. We then follow up with on-site instruction and frequent meetings to ensure each employee understands policy and responsibilities. Each employee is trained in industry standard safety programs as well as customer specific requirements. Our safety department would be happy to discuss any specific training requirements you might have. At Justice, we integrate our HSE policies into our business practice and strategy. We believe that our employees, the industry we serve, and the environment benefit from actively implemented HSE practices. Copyright © 2018 Justice, Inc.